LOS ANGELES, Nov. 10, 2018 /PRNewswire/ -- Artificial intelligence, blockchain, gene editing… who are the changemakers behind some of the world's most exciting emerging technologies? "Beyond Innovation" will deliver the answers with an insider's perspective only possible from those on the front lines. The new series pairs a leading venture capitalist and entrepreneur with an expert technology journalist for an international tech lover's tour of disruption at its finest. "Beyond Innovation" is independently produced by Globalive Media and will make its world premiere on Bloomberg Television (Bloomberg TV) this Saturday, November 10. The program will air on the financial news channel Saturdays at 5 p.m. New York, 10 p.m. London and Sunday 2 p.m. Hong Kong. Watch the promo HERE. Not your typical TV host, Anthony Lacavera himself is a disruptor to the core: a global investment firm founder and CEO with numerous successful exits and a passion for empowering change. On "Beyond Innovation," Lacavera travels the globe in search of investors and founders who, like him, are taking risks and betting big on our future. "The time is right for a series like 'Beyond Innovation,' as we're seeing this age of disruption rewrite the rules for both legacy companies and startups doing business," said Lacavera. "Some of the emerging technologies we feature are ushering in what many are calling the Fourth Industrial Revolution and changing the fabric of our economy by accelerating growth." "Beyond Innovation" is the vision of co-host Michael Bancroft, a journalist and former Bloomberg TV executive producer who also co-hosts a top trending tech podcast and radio show "The Feed with Amber Mac and Michael B" on SiriusXM. With his career sweet spot at the intersection of business and technology, Bancroft unearths the latest advancements in technology across industries and discovers emerging innovators turning the once-impossible into the probable. "From the U.S. and Europe to Asia and Australia, this show will span the globe in search of the best and brightest innovations poised to change the way we live and do business," said Bancroft. "This series reaches beyond the business-savvy viewer and engages general consumers with a window into the technologies informing today's global conversation." 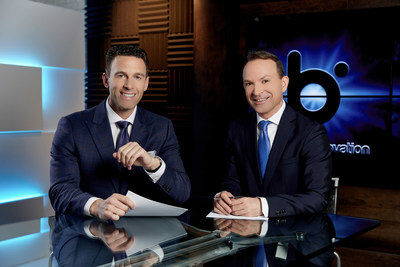 With 26 half-hour episodes, the debut season of "Beyond Innovation" features such notable guests as David Hanson, the former Walt Disney imagineer and pioneering roboticist behind "Sophia" and some of the most realistic humanoid robots on the market; Karan Wadhera, the Casa Verde Capital managing partner investing Snoop Dogg's money into cannabis companies; Robert Nelsen, the co-founder and managing partner of ARCH Venture Partners responsible for sourcing, financing and developing more than 100 companies, including 20 now valued at more than US$1 billion each; and Jeremy Lin, basketball star for the NBA's Atlanta Hawks, who is investing in a smartphone app that promises to change the way young athletes hone their skills. Globalive Media is a premier curator and producer of thoughtful multimedia content geared towards business-minded individuals. We tap into the latest business and technology trends, insider insights and advice from leading executives and changemakers from around the world to help our audience of entrepreneurs and investors build profitable ventures. Globalive Media is co-founded by venture capitalist and entrepreneur Anthony Lacavera and media executive and journalist Michael Bancroft. Some of the forward-thinking organizations we work with include #movethedial, PwC, Northeastern University and Dentons. Globalive Media produces the globally broadcast television series "Beyond Innovation," which delves into the most exciting technological innovations coming to market that can transform our world for the better. Learn more about our company at www.globalivemedia.com or on Twitter, Facebook, Instagram, YouTube and LinkedIn. Globalive Media is a portfolio company of Globalive Holdings, the investment firm of Anthony Lacavera. For more information visit www.globalive.com.